Cadillac Hotel on Leavenworth and Eddy Streets. After the 1906 earthquake, San Francisco’s civic leadership sought to show that the city was rebounding by promptly undertaking a series of building projects. Among them was the construction of the Cadillac Hotel at Eddy and Leavenworth Streets. As the Cadillac prepares to celebrate a public 100th Birthday Party on September 19, most San Franciscans are likely unaware of the hotel’s unique place in the city’s history. 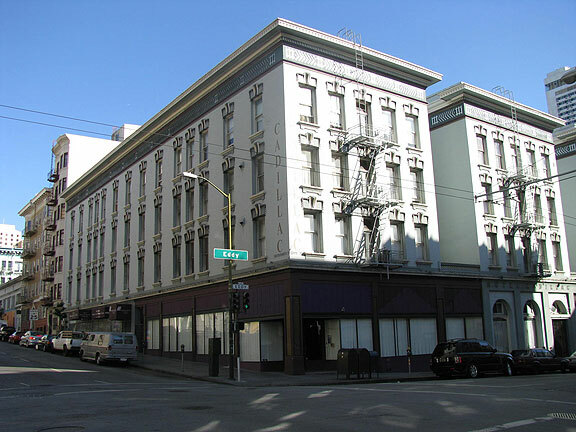 The Cadillac was a “supportive housing” hotel before that term existed, and was the first San Francisco residential hotel (SRO) whose dilapidations brought renovation, rather than demolition. Senator Dianne Feinstein was on the Board of Cadillac owner Leroy Looper’s original drug-treatment programs well prior to her becoming the city’s mayor, and Donald Fisher had an unfortunate stint as the hotel’s owner prior to launching the GAP. In many respects, the history of the Cadillac is the history of San Francisco. The Cadillac’s history is remarkably interlocked with San Francisco’s past 100 years. Built in 1907 to send a message that the city was coming back from the 1906 quake stronger than ever, the Cadillac was once a place where guests checked their furs at the front desk and there was a furrier service to ensure they were properly cared for. Those were the golden years of San Francisco, and the Cadillac’s mammoth size---180 rooms plus a ballroom, in addition to significant ground-floor retail space---made it a popular destination for those visiting the city on a short-term basis. Through the early 1950’s, the Tenderloin was a place where people came to have fun. Longtime San Francisco political leader John Burton loved the neighborhood in those days, and recalled the Cadillac as one of the many hotels where men could meet women before spending a night on the town. The Cadillac always had long-term residents and never catered to the nightly tourist trade. It may be the only SRO in history to contain an entire boxing gym (Newman’s), where Muhammad Ali once trained prior to becoming heavyweight champion. The Cadillac thrived in the days when the Tenderloin was an all-night town where people entered bars and everyone knew their name. Burton reports that one could “make book” (place a bet) in almost every Tenderloin restaurant, and that folks getting off work in the early A.M. would come down to the neighborhood to eat, drink, and make merry. But the election of Republican Mayor George Christopher in 1957 soon spelled the end of good times for the Tenderloin, as well as nearby Market Street. Christopher had vowed to “clean up” San Francisco, and this meant eliminating colorful facades on Market Street theaters, demolishing the historic Fox Theatre, and stopping bookmaking activities in the Tenderloin. By the mid-1960’s, the Tenderloin, like the rest of San Francisco, was in a state of decline. The Cadillac was acquired by a succession of owners, including a then unknown man named Donald Fisher. Fisher did more to destroy the Cadillac’s historic architecture than any prior owner. He removed many of the ornate features decorating the hotel’s columns, leaving only one remaining. Had Fisher not soon sold the Cadillac, he could have turned the entire building into the architectural equivalent of a Motel 6. Cadillac Hotel on corner of Eddy and Leavenworth. But fortunately for the people of San Francisco, Don Fisher sold the hotel to a man who then sold it for no money down to a fast-talking enterprising young black man from the streets of Harlem. Leroy Looper’s acquisition of the Cadillac Hotel in July 1977 represented a signal turning point in the history of the hotel and the Tenderloin neighborhood, and also mirrored San Francisco’s economic revival. Looper planned to physically restore the Cadillac to its 1907 luster, and to then house people getting out of prison. The 180-room hotel was only housing 40 tenants when Looper took over. Brad Paul, who lived in the Cadillac in the early 1980’s, recalls that the existing residents – most of them seniors – were not exactly thrilled to learn about Looper’s plans for the hotel. But the tenants decided they liked the changes. They were happy to have the caring management of Leroy, his wife Kathy, and legendary hotel manager Sarah Kearney. Kearney swept the front of the hotel daily. One would not know that anyone sitting against the hotel, or trying to deal drugs, would become the target of Kearney’s broom. This is not some Tenderloin myth----I saw Kearney in action when I worked across the street from the Cadillac in 1984. When Looper and Kearney talked about “cleaning up” the area in front of the Cadillac---which was a major drug corner prior to 1978----they meant this literally and figuratively. 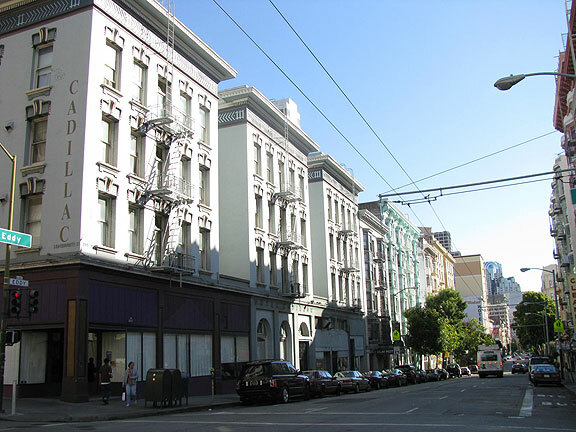 What Looper created at the Cadillac has since become known as “supportive housing.” When Mayor Newsom speaks of “Housing First,” and the idea of providing on-site services is described as a national model, keep in mind that for the West Coast, it all began at the Cadillac Hotel. Looper’s restoration of the Cadillac, the details of which were captured on slides and will be shown on the 19th, coincided with the community’s revival. The Cadillac played a leading role in the creation of the North of Market Planning Coalition, which went on to organize the community to successfully resist gentrification. During the early 1980’s, the Loopers would host an annual holiday party at the Cadillac that brought Mayor Feinstein and other city leaders down to the neighborhood. The Cadillac was at the heart of the great optimism surrounding the neighborhood’s future. But as Reagan Administration budget cuts began reversing the Tenderloin’s progress in the late 1980’s, the Cadillac also suffered. The Cadillac had opened a Sizzler restaurant on the corner of Eddy and Leavenworth, but a business designed to bring people into the neighborhood during the evening proved unsuccessful. All of the exterior changes to the Cadillac over the past 100 years will be on display at the celebration on the 19th. Today, the Cadillac operates as a Shelter Plus Care hotel, fulfilling the Loopers’ longtime mission of housing low-income people in need. The Cadillac now features weekly piano concerts on Fridays at noon, and in 2010 the former Sizzler commercial space under the hotel will be transformed into a Tenderloin History Museum. Leroy Looper’s remarkable life history has been set forth in his autobiography, much of which Beyond Chron published earlier this year.